Once a pilot retires, or hangs up their wings, the true health effects of aviation start to appear. Anyone that leaves the earth for more than a few flights per year is exposed to an environment that we weren’t meant to be so aerospace/aviation medicine is the study of what happens to us when we do. Since I live at 8700 feet, I figured I’d have an advantage in the low oxygen environment, and I did. We tried several altitudes to see and feel the effects and when my partner took off his mask at the oxygen simulated environment of FL350, he lasted about 20 seconds. He was adding 2 + 2 out loud and he told me the answer was, “one thousand, one hundred and onety one, one, one.” I couldn’t stop laughing because my co-captain was generally pretty serious and rarely cracked a joke, so I knew this was his honest answer. The “flight” nurse in the chamber with us told him to put his mask back on, but he looked at her and said, “Naw, I’m fine.” Oh yeah, he felt fine, but his brain cells were calling it quits. She had to get up, drag her own mask with, and force him to put it back on. I lasted for about a minute and a half, which was pretty good, so I told the other pilots in the chamber that they had to take back the blonde jokes and bow to their new brain master. 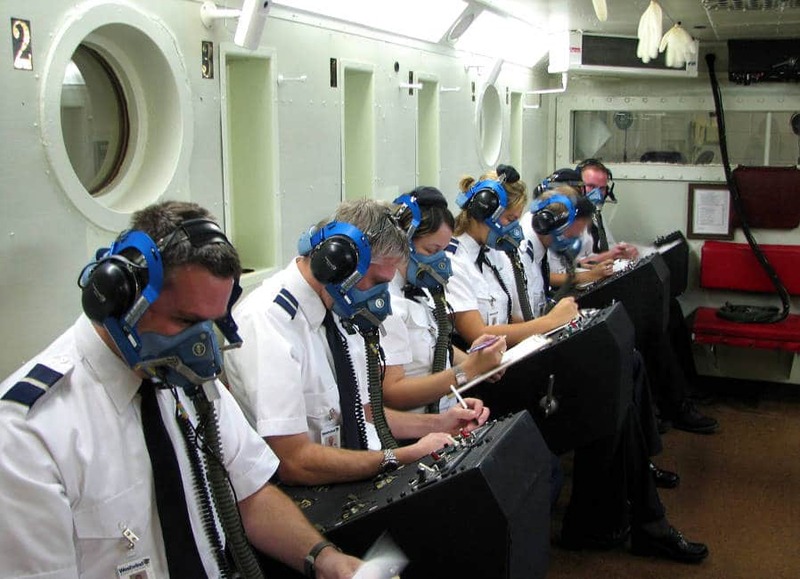 Flight school students in a hybobaric chamber, part of a study of aviation medicine. Photo by: ASU Polytechnic College. I was feeling pretty good about myself until they had a minor technical error during the “descent” back to ground altitude. They usually set a 3,000 foot per minute (fpm) descent, but we were coming down about 6,000 feet per minute. It wasn’t dangerous or excessive, but I was getting over a cold. I usually kept a close eye on our descents during our actual flights because my ears are sensitive to it even when I feel great. No one was having any ear issues except me, but it started to hurt so suddenly and intensely that I could hardly see straight. I raised my hand and told the technician my ears were hurting, but their response was that we’d be equalized shortly. The pain was blinding, so I put my head on my knees and clenched my fists so hard I drew blood. When we were equalized to the outside air pressure, they opened the doors and everyone got up except me. I tried to stand but the world went lopsided and I was now simulating a walk out of a bar. I sat back down and the nurse examined my ears. I’d perforated my left eardrum. Well, how about that for a simulated experience? Every pilot I ever flew with after this knew when the pressurization was coming down more than 3,000 fpm because I gave them the crusty eye. From this lesson, I knew that I better not fly with a cold. In this example, there was an instant and recognizable effect from exposure to a different atmosphere, but what about the long-term effect? What happens to the human body when exposed to a lifetime of aviation? I have partial hearing loss in my ear, but is it from this experience, or is it from the plastic molded earpiece I had inserted in my left ear while I flew captain? Or, is it from standing too close to the B727 APU when it’s -22F in MSP. The answer is simply yes to all because it’s cumulative. If it was just one exposure, I might be okay but put it all together and it means hearing loss. Welcome to the world of Aviation Medicine. It has a long, technical term, but it’s easier to look at it this way: Anyone that leaves the earth for more than a few flights per year is exposed to an environment that we weren’t meant to be exposed to, so aerospace/aviation medicine is the study of what happens to us when we do. Knowing what happens to the human body after minutes, hours, days, or years spent in the cockpit of an airplane is a critical component of aviation safety, but there aren’t a lot of comprehensive studies. From aura bleeding (yes, some say that your aura changes when blasting through time zones) to an elevated risk of prostate cancer and malignant melanoma, flight crews are a science experiment in motion. Pilots walk into the hum of a glass cockpit and spend hours exposed to UV radiation, ionizing radiation, cosmic radiation as well as the off-gassing of avionic components, especially after they get hot. It’s hard to draw conclusions, because pilots are breaking several laws of nature at the same time: disturbing circadian rhythm, crossing time zones, moving through magnetic variations, irregular work shifts, exposure to different and constant pressure changes, eating irregularly and processed foods (like crew meals), carrying constant high stress, breathing processed and/or contaminated air, vibrations, loud noise, and the compounding of all these cumulative effects to all of these exposures will keep scientists busy for years. One of the conclusions from a study is that the high occurrence of malignant melanoma is actually from excessive sunbathing on layovers, but how do they exclude all the other factors? When a pilot has a medical issue, they don’t usually go to their flight physician. Flight physicians have the power to take away medical certificates, so pilots end up going to another doctor to deal with the issue and once a symptom is confirmed and treatment underway, the pilot will go back to the flight physician and ask permission to continue to fly—or get their license back. Once a pilot retires or hangs up their wings, and the true health effects of aviation start to appear, flight physicians are not usually informed of the ailment, so it’s difficult to track the results of a lifetime of exposure to the elements. There is research and information about specific environmental situations and the human response. The behavior response to lack of sleep, hypoxia, and fatigue are examples of individual subjects that are taught in most ground schools, but that gives us an immediate symptom and behavior we can observe. What about a long-term comprehensive study and tracking of pilots’ health? What are the overall medical ailments that flight crews are more prone to experience? There isn’t one, but there needs to be. Since there is an infinite number of variables, it’s impossible to definitively say that “this” causes “that.” But, if we begin to track the specific diseases (especially cancers) that pilots develop, it would enable the community to work the problem backward. If there is a trend, we can see what factors cause it, the common denominators among those affected, and determine how we can reduce the exposure to the cause(s). It is completely anonymous and we will post the results once we get enough respondents. Re Erika’s article on her altitude chamber ride. I had a similar experience as an Air Force UPT student pilot in the T-38. It was my night solo ride. Although I had a cold, I was pretty sure I was invincible at 22 years old, and launched off from Selma (Craig AFB) for at cruise at FL 390 over Atlanta and back. It was a beautiful night until I began the 300K, Speedbrakes out descent. I felt a mild pain in my forehead so tried to clear my ears with a Valsalva – no luck. The pain got worse and I leveled off at FL 200 or so, as I had learned from aviation physiology. I even climbed back up for a slower descent – didn’t help much and the pain became intense, as if an ice pick had been shoved in my forehead above my right eye. This was the dreaded “Sinus Block” that we had studied – not so invincible after all. After an eventful landing (no such thing as an “uneventful landing”), I went to the base Emergency Room and they had to run a wire up my nostrils to open up the sinus and equalize the pressure. I saw the Flight Surgeon the next day and was grounded for two weeks until my sinuses fully cleared. That pain was so awful and memorable that I learned from that to never again to push it flying with a cold.